Uranium ore from the Shinkolobwe mine in Katanga. Schoepite-Curite-Uraninite specimen. The steel-gray matrix is pure Uraninite or Pitchblende with density 10.6 g/cm³. 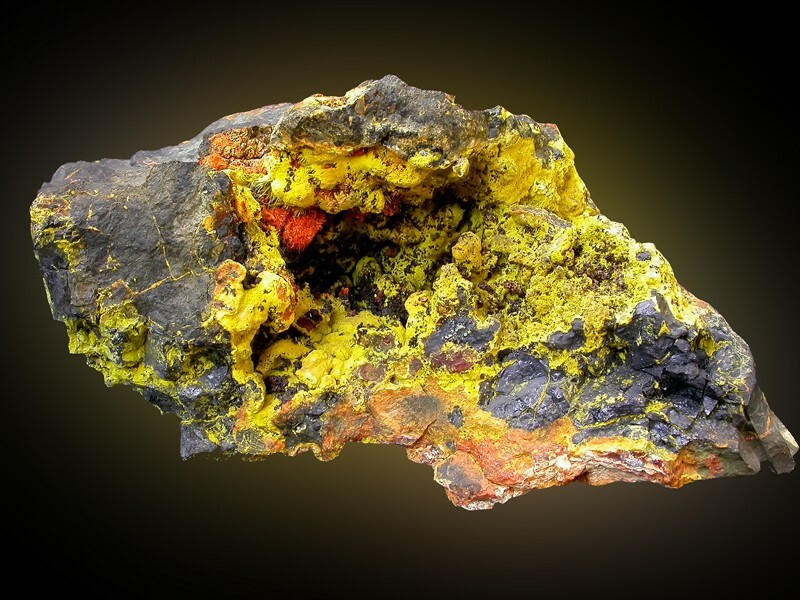 The yellow mineral is Schoepite, also an uranium ore. The red-ish mineral is Curite, a lead uranium oxide mineral. Ex-Carnegie Museum of Natural History, removed from display because "too hot." Size: 14.0 x 10.0 x 7.2 cm. The high grade of the ore (65 %) was partly the result of it being handpicked.